Oh yum! What a fantastic salad! I love that you added pecans to it! I too love the challenge of coming up with a dish with only 5 ingredients. Most recipes I use have tons of herbs and flavour so the challenge of creating a dish with tons of flavour but few ingredients was a lot of fun. I actually have a raspberry vinaigrette in the fridge that needs using up that I forgot about. Need to get it out and play around with it. I'd be happy to eat this for dinner all summer long! So easy, so tasty! This looks delicious and SO healthy! Great post, DB! Refreshing salad! Sounds easy yet yummy!! This is my go-to salad. It's the perfect combination of ingredients! Thanks for sharing! Yum! Your salad looks amazing and healthy! I love the vinaigrette! Sounds like a wonderful plate of food! I love using store bought rotisserie chicken in salads! Easy and guaranteed way to add flavor to your salad! love this! I just love the sound of your recipe, DB! So fresh, filling and delicious with that raspberry vinaigrette and the bite of those red onions! Perfect for the spring and summer months! This is my kind of salad. Sounds fantastic!! Quick, easy AND delish…the winning combination in my book. Thanks DB! I love light and springy salads like this. So perfect for this time of year! This is a fantastic salad. I love the ease and elegance this salad embodies. Easy, tasty and the added pecans are the perfect topper. Easy and delicious, I like that!! Beautiful salad that makes a whole meal, DB! This is so beautiful and so delish! Delicious salad, very refreshing for this days. Tasty inspiration. Love the raspberry vinaigrette! Toss in a bit of quinoa (when you can do 6 ingredients) and you'll have a "balanced meal in a bowl" :) Thanks, Chef! Hi there! Long time no talk, thanks for checking in! I've been really busy at work and have had a hard time finding a good balance between work and blogging. This recipe looks delicious, I love a good, simple salad! Great healthy dinner that's ready in minutes!! Great job! Looks tasty!! 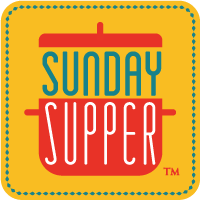 Thanks for sharing with the #SundaySupper group! It's so gourmet - you'd never know it was so simple! A beautiful salad with delicious, simple flavors. Perfect for this week's theme! I'm a big fan of this salad. I make it similar often, but since I don't have to use only 5 ingredients I usually throw some fruit of some kind in like chopped apples or craisins. I adore salads but I will eat them more often if they are made of a few ingredients like this one here. Red onion is perfect for a salad! I have everything I need to make this salad for dinner and I think I will do exactly that. Thank you for sharing this! Yum! I make a similar salad--I love using rotisserie chicken in all sorts of things! I love dishes that are easy to pull together. This can be made quick for a weekday dinner. Thanks for sharing! I love that you didn't sugar coat the pecan. Dry toasting really brings out the best flavor. Nice salad! Lovely salad! I haven't had raspberry vinaigrette yet and need to remedy that ASAP! This salad and a glass of wine would be a fabulous dinner for me any night of the week!